Free antique crochet patterns from HB Publications. Patterns are in PDF format in both screen and print resolutions. To view or print PDF files you must have the free Adobe Acrobat Reader. 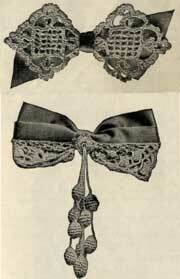 2 patterns for Irish crochet Jabots from approximately 1908. A Jabot is a frill or ruffle worn on the breast or throat of a garment, originally created to hide the closure of a blouse during the late 1800's through the early 1900's.